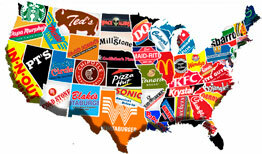 Choose the nearest restaurant for you and save your time! Please pay attention that “Fast Food in USA” does not take responsibility for any restaurants’ prices‚ menus‚ ingredients‚ locations etc. © 2015-2019 All Rights Reserved. We would like to get your ideas on how our website should be improved. Tell us about new features we should consider or how we can improve existing features.